*This post contains affiliate links. Although I may earn a commission, all recommendations are my own. Maybe you don’t have a gym membership and you are immediately thinking this post won’t pertain to you, but hear me out. In 2015, there were over 55 million Americans with gym memberships and about half of them actual use it! That means about 27 million people are paying for a service they don’t even use. Don’t feel guilty if this is you. Not everyone is made for gym life. Take a moment to consider some great at-home workouts to help save money. Now, if 27 million Americans are shelling out the cost of a gym membership, exactly how much money are they leaving on the table by skipping out on going? Average monthly gym membership = $69 —> $828 average per year. Don’t worry, you can still get TV! More and more people are opting for memberships through places like Netflix to help save money. Doing this would save you an average of $1,000 per year! However, you might be one of the bajillion people in the world who has got to see sports, or the news and doesn’t want to just binge watch all day. If that’s the case, consider switching to a Mohu digital antenna in order to save money and still keep some of the perks of cable. Mohu’s best-selling package is a value pack that helps you get TV on up to 4 different TVs throughout your home. The different designs and packages are highly modern and a far cry from your grandma’s rabbit ears. Find the right antenna for you! Click to enter your zip code and see how you can watch HDTV for free! Average monthly cable cost = $99 —> $1,200 average per year. Let me tell you, I and my family purchased a digital antenna years ago and have never looked back. Not only did we save money, but we also got a lot of time back in our day that we were wasting on clicking through the hundreds of channels on cable. Sure, you can shut off the lights, open the windows and make other small efforts to help save money on the cost of your energy bill. There are some great tips in my post 87 Extreme Cheapskates Money Hacks That Are Pretty Normal if you’re really looking for crazy ideas on how to cut back your expenses. Beyond the cost of energy, our planet is also in serious need of some environmental TLC. That’s why companies like OhmConnect have started working toward solutions. By signing up, you can potentially earn rewards just by saving energy. They offer different savings events that help you save money on your bill and in some states will pay you up to $300 for participating! Not only do you have the potential to cut the cost of your monthly energy bill, but you could actually earn some more money in the process! There is really nothing to lose, so why not get signed up for free and start helping our planet and your pocketbook. No, not another diet trend, I promise. It is overwhelming what the average amount people spend on food per month is. In the middle class, the average expense for groceries each week is about $150 (which still seems low to me.) Where the real trouble comes in is the $232 spent on going out to eat each month. If you’re keeping track that winds up being about $832 every month spent on food…and that’s average. Chances are most households are spending far more than this. Now, we can’t just stop eating. But, there are ways you can greatly reduce the amount you spend each month on both of these expenses. Let me show you how you can cut this expense in half through the following methods. Take for example something like The $5 Meal Plan. This is plan that was created by a busy mother of 4 to help other families create healthy and affordable meals for their families. Each meal costs $5 or less which would give you a weekly grand total of around $105 for groceries. On top of this $45 per week savings, consider shopping with different rebate apps! Depending on your individual shopping list, you may have a different result, however, based on my savings of $20 using Ibotta, let’s say you are able to get refunded $20 on your weekly grocery bills by shopping with rebate apps and coupons. This would bring your new weekly grocery total down to $85! To get more organized, take advantage of the grocery budget printouts in my budget bundle. When it comes to eating out, I strongly suggest sticking to at-home meals because that really is the best way to be healthier and save money. If you took your whole family out to dinner for around $60 and only did this 2 times per month, not only would this cut back your monthly spending, but you could also take advantage of some savings apps as well, just like you did with groceries! Ebates is one of my favorites to use when saving on the cost of going out to eat. Ebates works hand in hand with Restaurants.com to give you more money back on your purchases. Restaurants.com often offers great deals on local restaurants where you pay $10 and receive a $25 gift certificate. So, if you dined out 2 times, and used a gift card each time you would save $30 on the cost of dining out! Check out the deals. When we attended Dave Ramsey’s Financial Peace University, there was an entire chapter dedicated to discussing different ways to save both short term and long term by making changes to different insurance policies. I strongly recommend taking the full course to gain all the knowledge on this subject as well as multiple other financial topics. In order to keep things short and sweet, let me break down some of the best and easiest ways to save money on insurance. If you are paying an arm and a leg each month for the cost of health care, once you have solid savings in place, it would be a wise idea to consider increasing your deductible. This will lower your monthly cost. Just make sure you have good savings in place to cover the cost of your deductible should any major medical events transpire. Getting yourself set-up with liability-only insurance is a great way to cut back on the cost of insurance seeing as how more often than not, someone who does damage to your car will be insured themselves. Your insurance rarely needs to cover accidents where you were not at fault. That is the responsibility of the at-fault individual’s insurance. If you are working toward building wealth, Dave Ramsey shows how much money you can save and make by switching to term life insurance. Term life insurance covers an individual only for a certain period of time where full coverage insurance will last until you die. Dave Ramsey’s theory here is that, if you took the time to invest the cost of full term life insurance, you will actually end up with more money in the long run. If you have a 20-year term life insurance policy, you should be spending those 20 years saving, investing, becoming debt free, and paying off your mortgage. In this time period, your children will also grow up and move out of the house. Therefore, not as much money will be needed in 20 years should you pass away. The best estimate is for a $500,000 20 year term life insurance policy for $21 a month. This will save you $136 per month by not going with full-term coverage. Now you can invest that $136 and get more money than you would with insurance. Do not do this if you don’t fully intend on wisely investing, saving and staying out of debt. It’s not something I would recommend unless you plan on being wise in all financial areas of your life. 6. Get out of debt! AHHH this is just the worst/best one! No one wants to be in debt. No one likes paying interest or owing creditors! There are 3 major ways to stop dishing out money each month and start raking it in instead. Take out a loan or consolidate. Let’s briefly go over each area and how you can effectively get started. Depending on your individual situation, a different solution may benefit you more than the others. Yes! This is totally a thing! You can work with companies that will look at your debt and may work with your creditors to help get certain debts reduced. Disputing your debt is a great option if you are truly struggling to make payments and keep your head above water. See if you qualify! If you find yourself struggling to pay off credit card debt like we were, this is definitely an option that I recommend! If you look at the average American’s credit card debt of $16,000 and reduce your interest rate from 20% down to 17% you will be able to save money on your monthly expenses and make a huge debt in your yearly savings as well. If you are paying off multiple debts like car payments, loans, credit cards, student loans etc, it would be a wise idea to look into potential savings through loan consolidation. Of course, there is no better way to get your life and money back than by buckling down and paying off that debt! It’s a lot of work, but it’s totally doable if you stick to a smart strategy. We did this a few years ago and we were able to pay off $6,000 in only 6 months! Can I Afford to Get Out of Debt? Now that you’ve cut your cable, you may have a little more time on your hands! If not, I highly suggest you make the time each day to sit down and answer a few survey questions. By doing just a few surveys a day people average about $100 per month in extra cash! Sure it requires a little more effort on your part, but not much. The great part is, if you need a little more money, spend a little more time answering surveys. Most sites are simply working with businesses in order to get a better insight into their potential consumers. That means you are getting paid for your opinion! Everyone’s got some of those lying around, right? 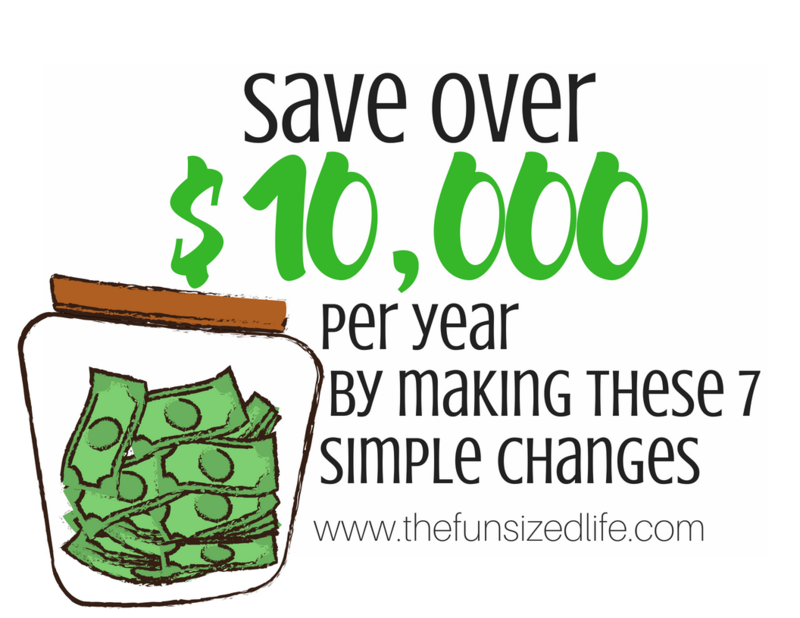 Just by making these 7 simple changes, you can easily save over $10,000 per year. It can all seem really overwhelming at first which is why the best way to do it is to just get started. Take the time to figure out and implement the methods that work for you. No matter what, you’ll come out on top if you just stick with it.